I know, its been a while since I’ve posted and I do apologise from the depths of my heart. I’ve been busy. In fact, I’ve been so busy I almost forgot to sleep this last weekend. I kinda got into the ‘zone’ with tidying up the workshop and grooming room, and then my head was buzzing with ideas and plans and projects… sometimes I wish I had a ‘sleep’ button. So, here’s just some of the stuff I did this past weekend. 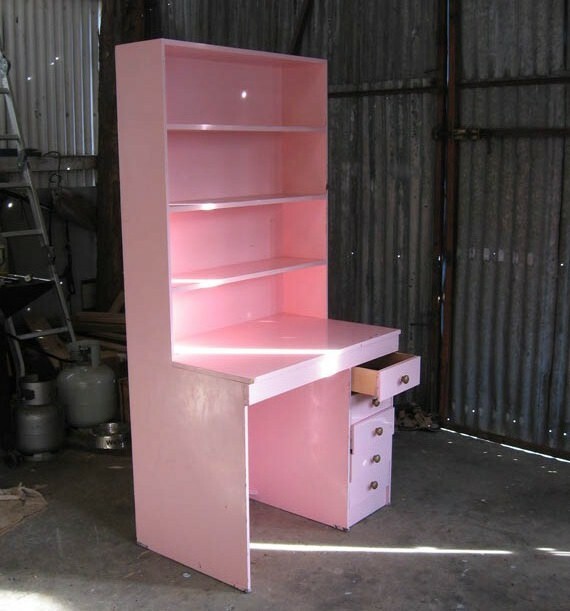 I decided to rearrange the grooming room to incorporate this big ugly pink thing I got from an op shop a couple of months ago. Very pink huh? I had planned to paint it and use it in the office. Or something… I mean, it was cheap. Very cheap. It’d come in handy for somewhere! It even came complete with all these stickers! ugh. Which wouldn’t come off. Since I wasn’t painting it I didn’t want to spend time scraping or sanding them off. And I was in a hurry to just move it into the grooming room and get it done. This is what that corner of the grooming room looks like now. 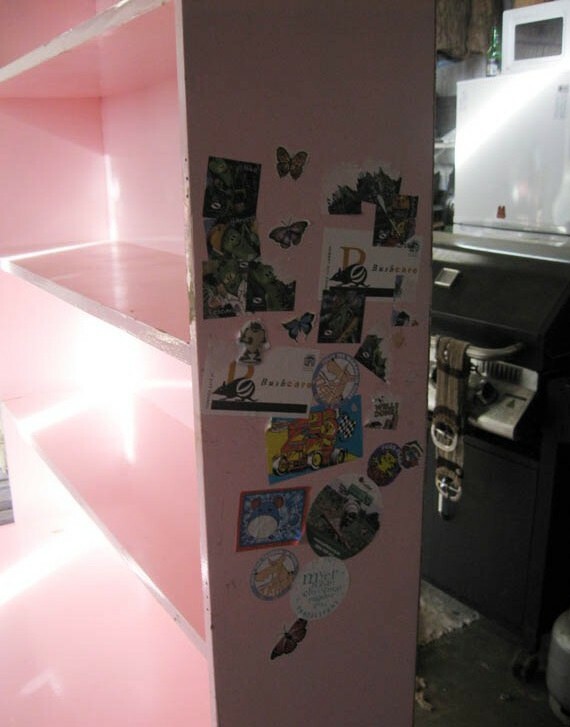 Big Pink in the corner holds all the grooming tools and beautifying products. It now has hooks on the side to hold some of my dogs’ fancy collars and hooks off the middle shelf so I can hang the clippers and dremel. And there’s a hook on the wall to hold the dryer hose out of the way. 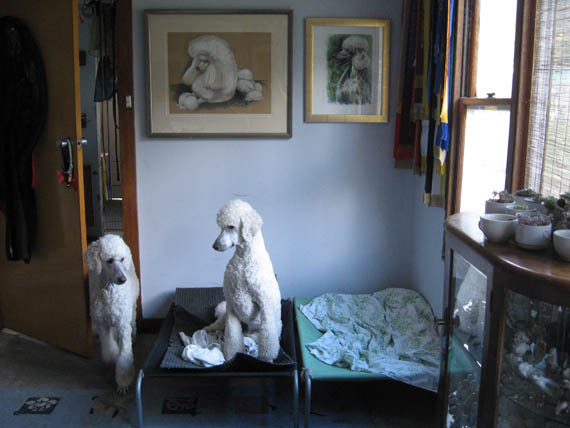 The other corner holds the bigger grooming table, part of my poodle collection (you can just see them all, clamouring to get out!) and the newest tip shop chair waiting to be make over. The floor, plain concrete, is covered with rubber tiles under the grooming area – easy to sweep up and nice and comfy underfoot. There’s an old rug on the other side of the room to further insulate the floor. The other side of the room, on the window side, holds 2 dog beds. Along the wall to the right of the above photo are dog crates, another display cabinet with just as many poodle figurines and dog blankets piled up higher than my head. 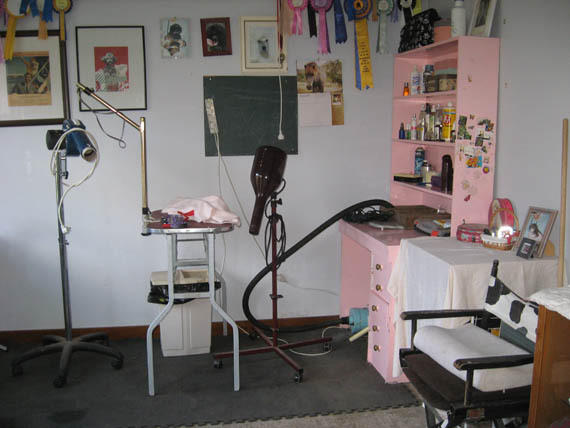 When I put Big Pink in the grooming room I moved out a bench, which is now living in the laundry. It works perfectly there – underneath it holds 2 laundry baskets plus 2 grooming/show tool boxes. The top of the bench is a great place to put washing baskets and sort washing. I’m planning to put a couple of shelves in there soon and make that room over a bit. The other things that were moved were 2 smaller cabinets which are now in the hydrobath room holding towels. Before you ask to see the rest of the casita, let me remind you that the casita is an old, OLD house… the original farm cottage on our property. It has no foundations as such, and someone somewhere along the line, thought that taking up whatever flooring was in most of the casita and replacing it with concrete was a good idea… It may very well have been a good idea. If the concrete wasn’t just sitting on the wettest ground this side of the great flood. So… the rooms with concrete floors are damp. Badly damp. One room is totally unusable. Unless you plan to grow mushrooms. The grooming room isn’t so bad, but its not great either. The hydrobath room and the laundry are … well… lets just say there are patches of concrete which never seem to be totally dry, even when I haven’t washed a dog in a week. In the front part of the casita, where floors are timber, its great. However, there are parts of the ceiling which are sagging or totally missing. In the damp areas there are walls with mould. Eeech. Given the floors get so damp in winter, how on earth do you even THINK about fixing the damp walls? When we first saw this place we dreamed of fixing up the old cottage. It has character. It has baltic pine ceilings (where it has ceilings). But its a real mess, and we don’t have the money to fix its problems. So, it remains a shed. 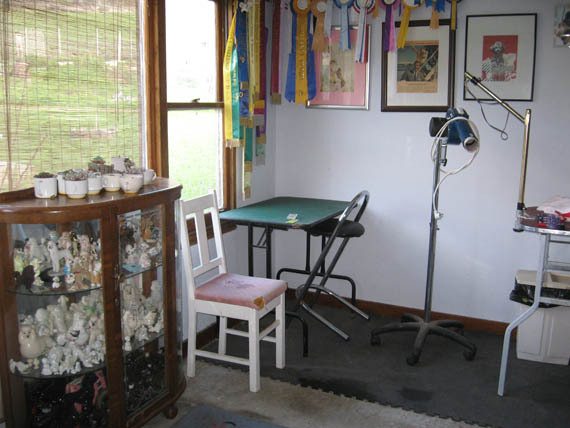 A grooming room. A dog washing room. A laundry. A workshop. A horse feed room. And a dark gloomy mushroom growing room. One day, when I’ve patched up holes in walls, replaced missing wall panels, whatever, I might be able to show you areas of rooms, like the laundry. Till then, trust me. It ain’t so pretty!